Now Available on BasharTV* and Instant Download, DVD and Instant Download!. 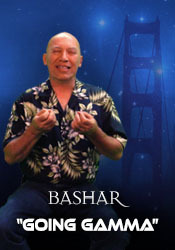 Bashar delivers a powerful meditation designed to connect you with the Gamma State; that frequency in the brain that is representative of being in the channeling state. The Gamma State connection will allow you to receive higher energies and more fully express your most creative self! • How can I allow all the nutrients from the good food that I eat to be absorbed? • How can I use the power of breath to create transformation? • How can I break the pattern that holds me to my negative beliefs? • Can people use the energy from my menstural cycle to go into an altered state? • Can demons can attach to your negative energy and amplify your negative beliefs? • If I quit my job will I be able to support myself as a singer and an actor? • How can I come to terms with aging and my body not being able to do what it used to? • In quantum mechanics they say that when a possibility is observed then the waves will collapse. So if all worlds are there at the same time, if they are not observed, are they real? How does this relate to evolution? • Can something be fearful and yet you still want it? • Can you talk about breakaway civilizations and secret space programs? • How can I heal my arthritis? • How can I use pyramid symbology to connect to the gamma state? • What is John of God? • Would you be able to give me a permission slip to improve my eyesight so I don’t need glasses? • How can we improve our educational systems around the world? • Why is NLP (Neuro Linguistic Programming) so effective? • Was the Giza pyramid once used as a power plant? • Can you give a description of the Yayel civilization? Do they have any messages for us? • Can you give a physical description of the civilization on the Barnard Star system? What will the first steps for contact with them be? • I’ve been hearing talk that the Earth is actually flat. Is that true? • Do our Oversouls have unique names? If so, what’s the name of mine? • The transition point to fourth density, has this already happened or is it in the future? • How can I overcome heartbreak? • Have I ever met part of my Oversoul, another human, on Earth? • What’s the reason that entities from other realities feed off of chakras from humans? • What can you say about earthquakes and the San Andres fault line and how it’s going to affect us? • What can you say about the sighting of the recent missile and how it triggered conversations about UFOs? • If excitement can change quickly, then can changing your excitement’s direction mean that you’re not following through with a commitment? • Does the whole collective consciousness shift when one person awakens making every reality for everyone else change? • Why is it that every time I see whales and dolphins, I feel so emotional and I cry?